Every woman dreams of owning her own diamond ring. Solitaire or cluster, we all have our preferred style. Sometimes the only obstacle to acquiring gorgeous diamond rings is price. Diamonds can be expensive and the higher the quality of the diamond, the higher the price. There are many different qualities of diamonds on the market. Some have inclusions and some do not. Some are colored and some are clear and colorless. The best way to save money and to find out which diamond ring to purchase is to do some online shopping with Novori. Diamond rings can come in many different settings. You can buy diamonds from jewelry stores in yellow gold, white gold, platinum, silver or even a combination thereof. Silver diamond rings are harder to come by but don't have the history or magic of gold. 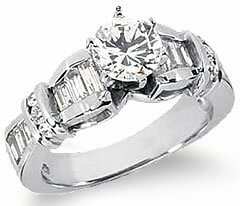 They can be a wonderful option for those who want an inexpensive diamond ring but most brides still choose a gold ring. There are sites online that specialize in diamond and silver jewelry but at Novori you will find the best prices and value on gold and platinum diamond rings. Diamond rings have been popular for quite some time. Diamonds are what most engagement rings and wedding rings have as their focal stone. Diamonds are not only absolutely stunning to look at, they are also the hardest natural precious stone. This means that you can wear it everyday and it will not scratch or break the way other stones may. Diamond rings are a perfect way to show your love and committment and can even be used as birthday presents. Diamond rings can be given for any special occasion. It is important to note that diamond rings are not only for girls and women. Many men sport diamond rings as well. The sales of men's diamond rings are growing year by year as more and more men are realizing the beauty of these stones and of jewelry itself.